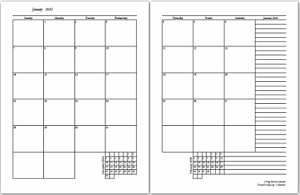 Ideal for notebooks, the printable calendars on this page print one month per sheet of paper in portrait orientation and the dates are placed in blocks. Calendar SW utilizes the margins for Saturday and Sunday in order to increase the width of the blocks for Monday through Friday. The blocks are shortened to allow more ruled space. The file includes an optional cover sheet. While it is okay to print the pages of this file back to back, I recommend printing each month on its own sheet of paper. If desired, print lined paper on the back of the months. 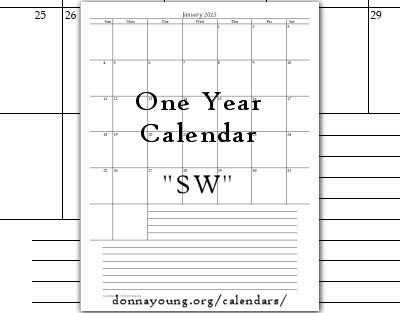 Calendar SW is included with the Basic Subscription and YoungMinds or you can purchase Calendar SW for the year 2018. Purchase includes the matching lined paper file. This is the One Page Monthly Block Calendar Each file prints all 12 months. You can print the months back to back or print lined paper on the back of each month. This calendar is available in XLS format to YoungMinds subscribers. The One Page Monthly Block Calendar is included with the Basic Subscription and YoungMinds or you can purchase the One Page Monthly Block Calendar for the year 2018. 1-Page Block Calendar's Cart Listing. Looking for the 2-Page Block Calendar?